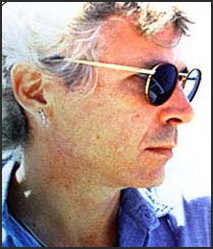 Canadian composer John Mills-Cockell has been making music for over four decades. Whether it's his work on documentaries, episodic television, film or stage, Mills-Cockell's versatility has won him numerous awards and accolades over the years. Early work by the Toronto musician included scores for such horror outings as The Clown Murders (1976), Paul Lynch's Humongous (1982)...and his memorably ominous music for Roger Spottiswoode's slasher-on-the-rails Terror Train (1980). Mills-Cockell was generous enough to sit down with us and recall his memories of composing the soundtrack for Terror Train some 30 years ago. Additionally, he also provided exclusive sound clips from the original Terror Train score which we're featuring here. The Terror Trap: John, when did you first know you were interested in composing? John Mills-Cockell: When I was fifteen. I heard a concert that included one piece of 'electronic music,' and I was hooked. TT: Prior to composing the music for Terror Train, you had already completed a few film and television projects (including the The Clown Murders). How did you come to be attached to composing the score for Terror Train? JMC: Someone sent Roger Spottiswoode my demo when he was looking for a composer. There was one song on it which he was especially attracted to. It was called, of all things, "Terrorist Blues." I think it indicated to him that I was a bit outside the box in terms of musical approach. TT: When you composed the score for Terror Train, was it based on viewing dailies? Or did you watch the whole film all at once? 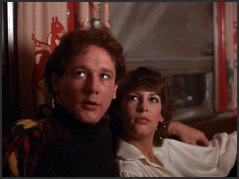 JMC: I worked on videocassettes of the rough cut. I was living some distance outside Toronto at the time. If I remember correctly, the shooting was done in Montreal. Nowadays, videos can be posted online, demo music is added by music production, and delivered to post. But that kind of process wasn't possible at that time. Normally, an important step in the process is the screening with the director. This is when he/she discusses his/her vision of what needs to happen in terms of the score to best support the picture. The video has time coding so that the composer can fit the music to specific events: actions, edits, dialogue. TT: How much input did Roger have into how you approached the composition for the film? Did he give you carte blanche and wait for the finished piece? Or did he offer suggestions at various points? JMC: It was a subtle collaboration. Before the recording session, Roger met with me again to hear demos of what I was planning to record. He probably had specific notes about things he thought should be adjusted at that point. But directors know that they will be surprised on some level, and hopefully in a good way. Of course there are things that only the director knows about what is needed in any scene, and he/she will try to convey that vision. It's also possible that the composer will have an idea not imagined by the director which will add to the strength of the scene and most directors are open to that possibility. TT: And what were the next steps? JMC: Well, then the orchestra recorded the underscoring to Terror Train in Wembley, London, at CTI Studios. Generally speaking, this enables the conductor (as well as the production team) to understand how the music will fit with the picture. Inevitably there are changes once the music is recorded. Once we see the dramatic effect of the score, there may be better ways to fit it with the picture. Or, there may be changes to the film which will necessitate changes to the use of the music. Finally, the music is mixed with sound effects and dialogue. I think that's pretty standard. There were also a number of bits of music which were not recorded to the film. Often called "source," these bits were for scenes in which the music (mostly rock-ish in Terror Train) serves simply as background as if it were radio music, a party band, or whatever. TT: Can you explain what specific instruments you used to create the score for Terror Train? All orchestral? Any synthesizers or cooked effects? JMC: There's not any synthesizer sounds that I recall. But I did use a Vox electronic organ and something called a Solina. We also processed a number of conventional instruments; what's now called DSP (digital signal processing). TT: We hear lots of brass horns in the score, correct? 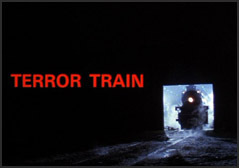 TT: In several different sequences during the score for Terror Train, there's a sort of musical leitmotif of "train wheels that are churning and turning." The creepy sounds are done in a low bass, with a steady rhythm to them. The result is an ominous, brooding suspense. Can you elaborate on how you devised this particular theme? JMC: Yes. The "churning and turning" was created mostly by the use of the Vox and Solina on which tone clusters were played rhythmically (inspired no doubt by American composer Henry Cowell). Another effect that contributes there is the use of DSP on some instruments, particularly the bassoon. 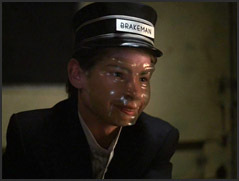 TT: Director Spottiswoode (and cinematographer John Alcott) did a great job of creating a feeling of claustrophobia in the sequences aboard the train. A feeling of being trapped. Your music seems to mimic this claustrophobic feel. Do you recall if creating a claustrophobic mood was foremost in your mind when you set about composing for the film? JMC: I wouldn't say "claustrophobia" came directly to mind when I was working on this, but certainly the lighting and cinematography were a great inspiration. 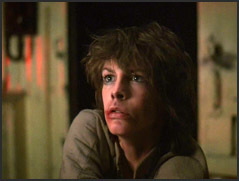 And Jamie Lee Curtis' wonderful work in it helped, of course. TT: Spottiswoode explained to us how the shooting schedule for Terror Train was short, efficient, and to the point. Did you ever make a visit to the set or was your work done entirely off set? JMC: No, I never visited the set. My work was entirely off set. TT: Do you recall how long did it took you to compose the score? JMC: Complicated question, because it was done in stages as I mentioned. 20th Century Fox felt that we could beef up the orchestral score and so I added more instruments and we recorded the cues again. When I realized this was happening, I decided to enhance the score in other ways with the use of electronics and various other instrumental techniques. TT: What's the biggest challenge or problem you recall about composing the score? JMC: The biggest challenge was when Lionel Newman - the music director at 20th Century Fox - saw the film married up to my music. He felt the music could be bigger and scarier. I met with him and he expressed how much he liked the score, but pointed out that there was a lot of white space in the score pages. There were many players in the orchestra and I hadn't given them enough music to play. (Laughs.) Although it was pretty harrowing at the time, this turned out to be a fantastic opportunity. Because I was able to go back into the studio to experiment with a small group of musicians, and based on our new work as well as the themes already composed, I recorded bigger versions of many of the cues. This was all only possible because of Roger's strong belief in my work. The score for Terror Train was nominated for a Genie Award for Best Film Score, a pretty prestigious accomplishment for a low budget horror film. Any thoughts on your nomination? JMC: Just that it wouldn't have been possible without Roger's encouragement and support. TT: You went on to a long successful career in music composition after Terror Train. Do you recall if being nominated for a Genie at the time affected your career in any way, or not? TT: In addition to Terror Train, you also composed music for two other theatrical horrors - Humongous (1982) and The Clown Murders (1976) . Any thoughts on composing for straight horror as opposed to composing for other mediums, such as classical theatre, literary drama, etc? JMC: It's fun composing music for the horror genre, because one is compelled to find new, innovative ways to lure the listener. It's interesting to try to create that mood of suspense and dread, prolonging the inevitable. But that's only possible if the potential is inherent in the picture. In order to do this, the composer must experiment...try original things, but without completely losing touch with the viewers' frame of reference. When creating scores for other genres and formats, this balance is not the same. Often it's better to stick with something rather less adventurous, although this is not necessarily alway true. It usually depends on who one is working with, since scoring for anything at all is a collaborative effort. TT: John, thanks for your time.